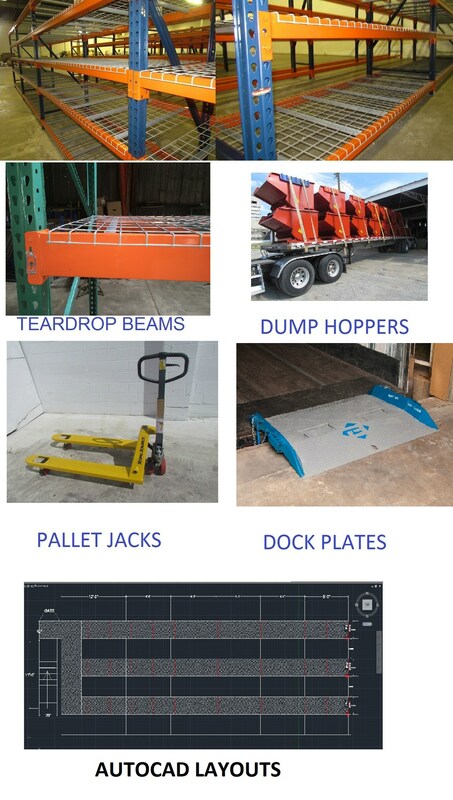 pallet rack shelving teardrop racking forklift industrial fabricator warehouse racks amp; estanteria. Please Note our new address. WE MOVED! We recently moved from our slum of a warehouse in Kansas City (See our Hisory), to a nicer building in the unincorporated area between Kansas City and Independence, MO. This area appropraitely called " Dog Patch" by locals is the armpit of the metropolitan area. We have incredible inmmediate access to the freeway; and working restrooms for a change. And by purchasing this building , I've been able to go from a low monthly lease on a warehouse to a lower mortage payment on a building own in a few years. Now we get to enjoy a little A/C and you get more savings. When our racking of shelving product arrives at your facility it is new and factory fresh never sitting outside unless you decide to ship it on a flatbed without tarps. Unless you tell your warehouse where it came from it will never know you found a bargain and underpaid for product that came from "Dog Patch". Welcome to Pay Less pallet racking shelving. We can meet all of your pallet rack needs and can save you money on pallet rack over anyone else while we do it. If someones cheaper than us, it's probably time to call the cops or the IRS. We absolutely refuse to be undersold; it's that simple. How do we do it? Glad you asked. Here's the answer in three parts. I've been in the pallet racking and shelving business for 15 years and have built a load of great working relationships. I work at wholesale or below with nine different manufacturers. They know I shoot straight and I'm in this business for the long haul so they give me the best possible price on pallet rack and supplies. I know ultimately it's you, not them, who keeps food in my kids mouths; so I have no problem working manufacturers against each other to get the price where you want it. I can get you the Cadillac of pallet racking.. or the Plain Chevy ; it's up to you. The most important thing is to get you the pallet racking that will handle your needs. Since I'm not affiliated with one manufacturer I can consult with you to determine what type will work best for your situation. I won't sell you better than you need just to make more money (but if you're dead set on the best, I won't turn your deal away either). In fact I will work with you to give you the most for your money, period. No one will work off a tighter margin than me. Every car dealership that advertises on television claims that volume makes their cars cheaper than the next guys. Having bought a few cars in my day, I seriously question if that works in the automobile industry; but having been in this line of work for 15 years, I KNOW volume drives down price in the pallet rack business. 2) It allows me to build up my own inventory of pallet rack and wire decking, increasing the chances that I'll have what you need in stock. This way even small orders can often be sold at large-volume, discounted prices. Some people like to work in cushy office space with fancy things like running water, heat, and bathrooms. Well I'm not "some people" I lease warehouse space in the low-rent industrial part of Kansas City, I bought my office/jobsite trailer outright for $500. Skylights provide all of our lighting, keeping electric bills small. Our heat is provided by Carhartt at no monthly charge. And for anything that can't be taken care of out the back door of the building, our corporate restroom is located inside this QuikTrip four blocks away. Some, more crass, people might call our space a "shithole." I call it smart. Our central location in the Midwest results in some of the lowest shipping rates in the country. And like everything else, we pass the savings on to you. The whole operation is run by me and Roy, here. What we lack in good looks we make up for in hard work and a dedication to saving you money. Can anyone be cheaper than us for pallet rack and wire decking? Sure!! If they work from a folding table in their garage! They don't have any stock or inventory, remember we take your large order add to it to get a better price from the manufacturer and then ship your product direct and add the extra material to our facility. The extra in stock pallet rack and wire decking material we can now offer to people in a hurry or smaller quantity customers that need product fast without having to wait 4 to 5 weeks or pay a huge premium for a quick ship from the factories. This way if you are adding on in the future a few items you know we will have, and you will not get hosed trying to add on a couple new sections or racking or shelving. Give us a call: 816-444-6500 or Email us. Check out the article in the KCstar about us! Check out the article in the Pitch Weekly about us!